Bright lights, casinos, street performers, and...filters? 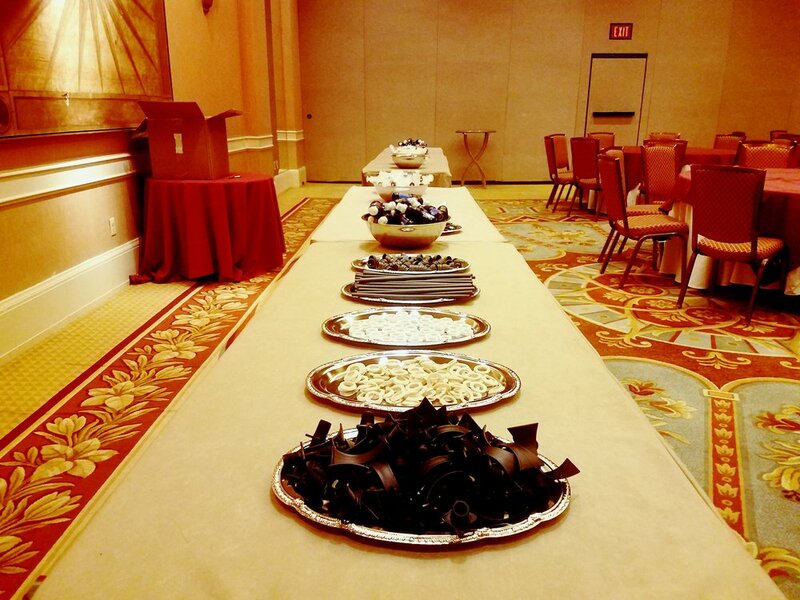 Shane Hillman, Wine To Water project manager and chocolatier, traveled to Las Vegas in February to lead a filter build demonstration with Milenta Biotherapeutics. Milenta held the event to celebrate the launch of their new antibiotic, and a Milenta employee worked with Wine To Water on a previous filter build suggested that Milenta invite Wine To Water to be a part of the launch. Wine To Water's involvement was meant to serve as a way to keep employees engaged and do something hands-on. Shane's presentation had an even larger impact than providing audience engagement. A typical filter build covers the who and what of Wine To Water, but also focuses on Wine To Water's purpose and the importance of serving in communities. Shane said that the idea of the program is to let people know where they can fit into Wine To Water and understand the difference they're making. "It only lasts an hour, but the impact is 100 families can now have clean water for 10 years," Shane said. "The concept of it is to have people understand that there's a much bigger picture here that they're a part of." Shane highlighted Wine To Water's work in Nepal at the Caesar's Palace filter build. The Nepal program is a great example of how filters can fit into a three-year program, and even into longer-term programs, Shane explained. After Shane walked the crowd through the filter build and led a question and answer session, Melinta execs told him that they wanted to start a partnership with Wine To Water. They did so with a $5,000 donation toward the Nepal program. The generous donation will further allow for sustainable solutions to be accomplished, Shane said. One of the solutions Shane hopes to accomplish in the Madi region and Dahkhani community in Nepal is to create sustainable living teams (SLTs). SLTs are centered around a group of women who eventually build up a savings program. The women meet each week and bring whatever amount of money they have. Each meeting, the group will select a different woman to receive a small loan, which could enable them to buy chickens, sell eggs, or buy produce. After they pay back the loan, the interest from the loan supports the water project. Milenta's financial support for this project will have an incredible impact. Shane thinks that the partnership is one where they're already on the same team - Wine To Water and Melinta are both dedicated to helping people. "[It was] so amazing to see this huge pharmaceutical company ready to serve with us on the ground level," Shane said. While Shane was thoroughly impressed with Milenta's desire to help diminish the global water crisis, he couldn't shake the feeling that he was in a city famed for its excess. When he passed through the casino and noticed people spending $50 on a meal, $50 on slot machines, and on a $100 bar tab, he found himself getting frustrated. "That $200 could have been spent on four filters that wouldn't have been just a quick thrill," Shane said. "That could have been 10 years of clean water for their entire family. That could have been a child that didn't die of dysentery. You're gonna down that drink, the flashy lights are gonna go away, and what are you left with?"